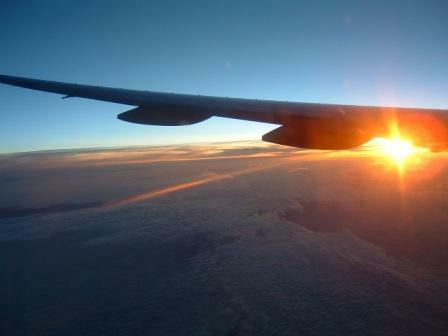 Travel can be very addicting! So far, I’ve been to 10 countries and numerous states. Along the way, I’ve learned several helpful lessons. Most travelers have heard the country-specific advice, like don’t eat with your left hand in India, don’t point the bottom of your feet at people in China, or that the “ok” hand gesture is not so ok in Brazil. So here’s a few travel tips that could be applied nearly everywhere. Do your research beforehand! Learn about the country’s climate, history, religion, special customs, holidays, etc. Try to learn something in the local language before you go, even if it’s as simple as “Hello.” People appreciate the effort you make to understand them. Cross pack! If traveling with others you trust, put some clothes & essentials in another’s bag, so if yours is lost, you have something to fall back on. Be nice to the check-in staff; it’s not their fault airlines are inherently evil. Food and drink is a key element of hospitality in many countries, especially out East. Unless you have a medical reason, don’t turn down what they offer you. Don’t start riots. Most people won’t like you if you do. Don’t drink the water! Unless you have made sure it’s been purified. This includes watching out for ice cubes and items washed in local water, like lettuce. What’s your favorite or most helpful travel tip? Let’s keep the list going! Everyone needs time to relax, and this globe-hopper is no exception! 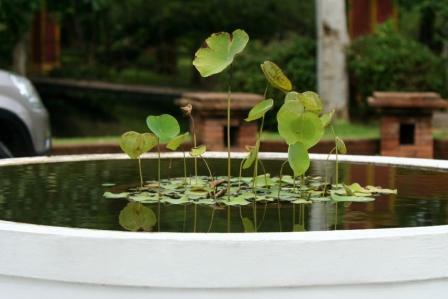 I took this photo at the Suan Bua Resort in Chiang Mai, Thailand, during a week of rest (and more exploration). While scenic pathways, Thai massage, and colorful butterflies & flowers are a good way to relax, Chiang Mai offers many more options for the more adventurous traveler. Chiang Mai is the unofficial captial of northern Thailand, and a haven for Western tourists and retirees who want to visit somewhere with a temperate climate, good exchange rates, and lots of people who speak English. I had a tour guide who obviously loved her job, and she showed me some of the usual tourist destinations like the Tiger Kingdom, Maesa Elephant Camp, jungle zipline tours, a hill tribe trek, and a butterfly & orchid farm. What is the most unique tourist site you’ve seen while traveling? I took this photo from the top of Festung Hohensalzburg, which roughly translates to “Fortress High (Above) Salzburg.” Appropriate, I guess. It was a good view of the city, and they had a great classical music concert. That was after a day of exploring the salt mines on the Austria/Germany border. If you’ve never ridden a speed slide into a cave, you have to try it! For those on a budget, even walking around the old town to see the baroque architecture and trying out the variety of food is a good way to spend the day. 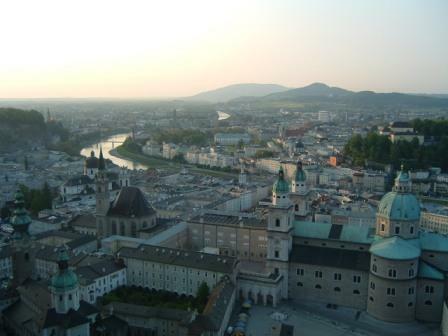 Salzburg was nominated as a UNESCO World Heritage Site in 1996. A quick search online will reveal a long list of things to do, or not do, when visiting Salzburg. No matter what type of activities interest you, I would definitely recommend taking a trip here next time you’re in Europe! Sound off if you’ve ever visited this city! What was your favorite thing to do or see? Ok, now it’s your turn! What would you add to the list? What’s your favorite way to relax? Even on a semi-deserted island in the middle of nowhere, you can’t get away from sports! On a trip to Indonesia, I visited one island that only took ten minutes to walk from one shore to the other. There was a village on the island, and the people were excited to have tourists visit them and learn about their culture. They showed us everything they could think of, including one of their favorite pastimes – sailboat racing! The rules were pretty simple: sail out to a certain island a good distance away, make a loop around it, and come back before anyone else. Oh yeah, and don’t dump yourself and the boat into the ocean in the meantime! Easier said than done. Several of the men from our tour group hopped in the boats with the locals to give it a try. At least we gave the islanders a laugh! They lined up to watch our guys attempt to maneuver those big sails (or, in some cases, just bail water as fast as they could while the “experts” steered). Either way, whether from shore or on the ocean, we all had a good time. 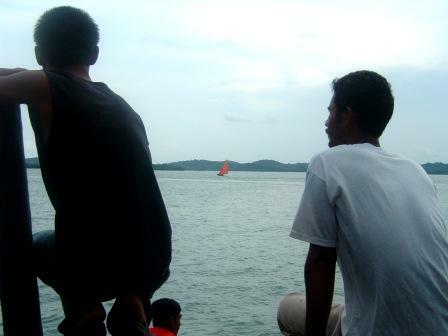 Sailboat racing is actually a very popular sport around South Asia. There are championships and boating clubs & associations in some countries. Others, like our islander friends, just have informal competitions to connect with their communities. No matter what the community or sport, it seems that competition is part of human nature. Just try and beat that! What is your community’s favorite sport? Does taking part make you more connected with them?